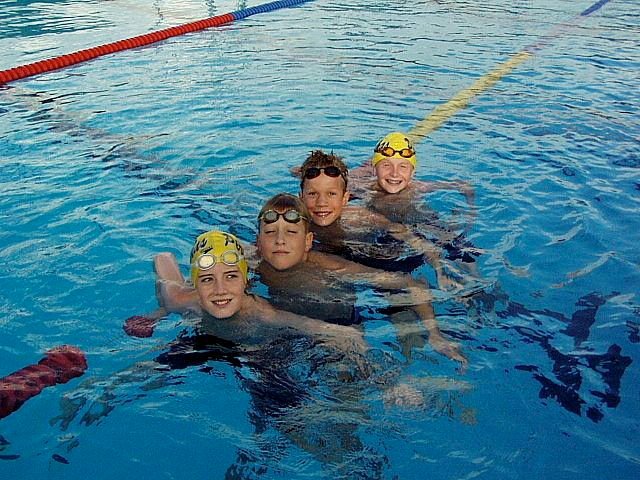 Can parents make their kids swim faster? 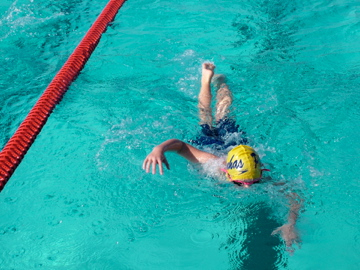 My daughter swimming in college. “Dad! It Doesn’t Help!” is a sports parenting book to “Become the Ultimate Sports Parent” by Mark A. Maguire. Although the book is based in Australia with a dad figuring out how to be a better sports parent for his son with USA Major League Baseball dreams, I could relate as a swim mom. During the baseball season a few years ago I asked my eleven-year-old son what do all the kids in the dugout think when their parents urge them on with instructions and encouragement as they are playing the game? I further pressed him. What about when I call out some last second reminders just before you bat, you know, the things we’ve talked about during the week and to help you remember what to do. Okay. That one struck home. 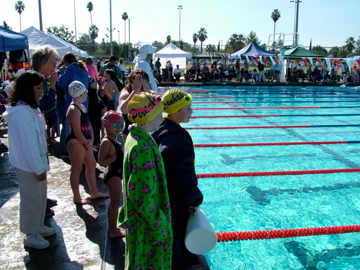 As a swim mom who used to search frantically for my kids before each one of their races to impart some last minute instructions, I am frankly a bit embarrassed. 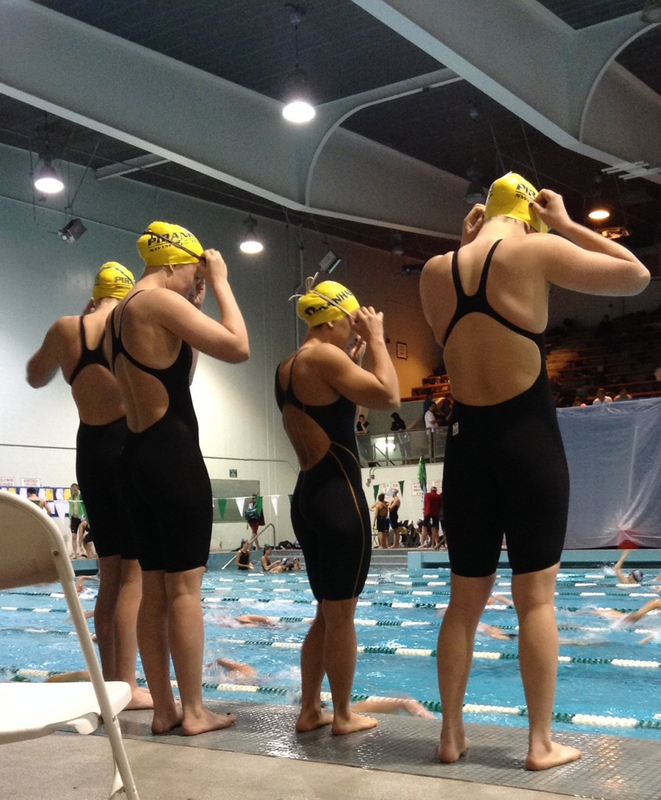 I honestly thought that whatever wisdom I was going to tell them right before they got on the blocks was helpful. Not only helpful but would be the determining factor on whether or not they won their heat, got their coveted cut to the big meet, and would earn a college scholarship. Well, I’m exaggerating a bit with the outcomes, but I thought they wouldn’t do as well without my input. In truth, I was probably a distraction. An annoyance. A royal pain in the behind. My stress level was running high, I was climbing over parents, pushing through crowds to grab my kids and do our little last minute good luck ritual. Ugh. Yes, that was me. Eventually I calmed down. Or at least I wasn’t so obvious about my nerves—and let the coaches coach while I sat in the stands or at the end of their lanes and cheered. I do think cheering has some small affect on our kids’ sports. It shows our enthusiasm for the sport. Cheering helps us release tension. And it shows we care. 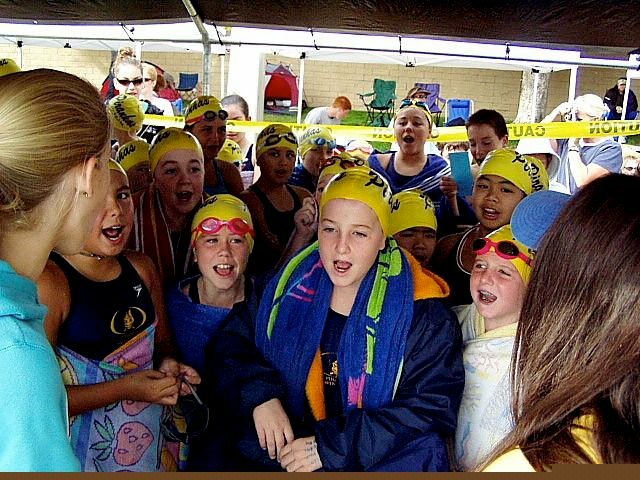 Teammates cheering at PAC-12 Women’s Championships. What things have you done as a sports parent that you’d never dream of doing today? 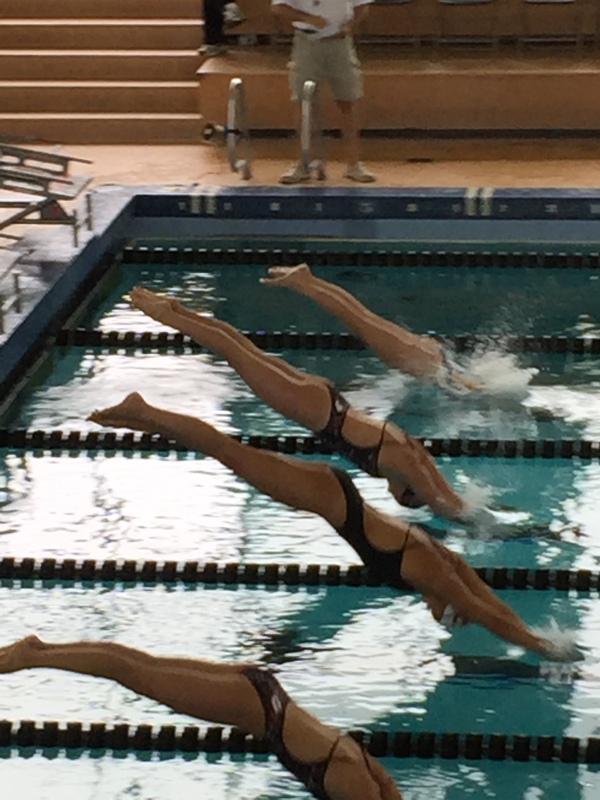 My daughter diving in for the 1000 free during a dual meet. Utes vs. USC. When my kids started swimming in their Mommy and Me class in our city pool at age six months, I had no idea how swimming would evolve through the years for our family. 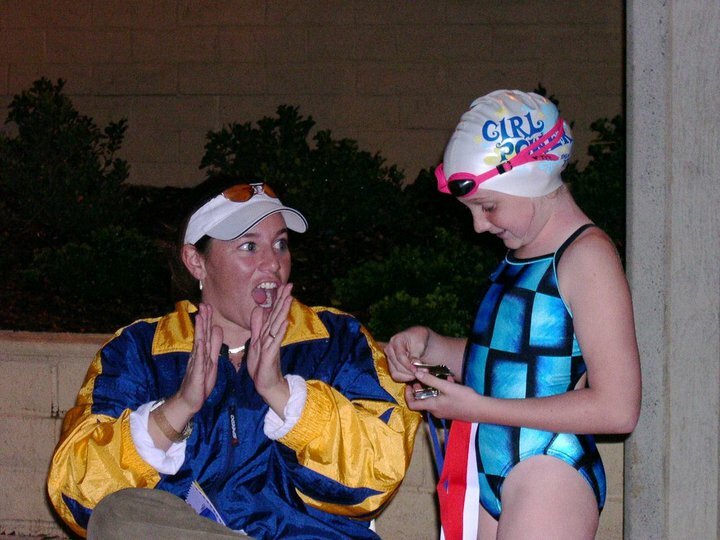 Here’s an article I wrote a few years ago about the little things I’ve enjoyed as a swim mom. We went to my daughter’s first college dual meet of the season this weekend. I loved every minute of the meet, but even more, spending time with her. 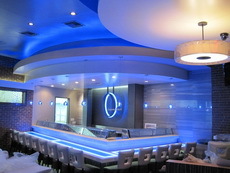 She invited several swim teammates out to dinner. It felt like the sprinkle of rain after a long drought—listening to them laugh and talk about their meet and practices. 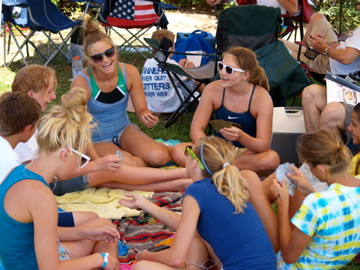 I didn’t realize how much I miss the little daily things about being an age-group swim mom. I miss the kids hanging out. So many personalities, so many different families, all bound together by one common goal. Swimming. I have a fierce loyalty to our team and the couple times when factions of parents split off to form their own teams, I was shocked and hurt. It felt like losing members of my immediate family. I’d always wonder why? I never thought we had a bad experience—maybe at times less than perfect—but I guess that’s part of the reason I didn’t understand. Good times were sitting together in the stands cheering for all our kids. Getting the new team t-shirts, sipping Starbucks on a chilly winter morning under the pop-up tents. Chatting and laughing with parents while we waited to see what the day’s meet would bring. 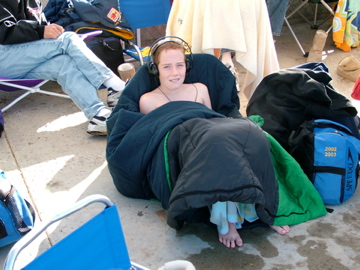 I loved working with our parents and officials under the admin tent, in awards, or in the snack bar at our home meets. 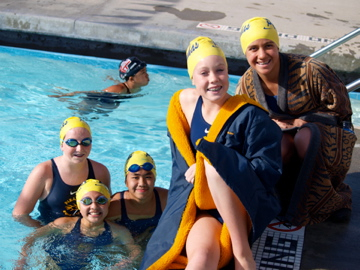 The team cheer at an away meet. I loved having kids over to the house to hang out between morning and afternoon practices during long hot summer days. I loved cooking eggs, bacon and sausage in bulk for a pack of hungry swimmers. I was amazed at how much they could eat as a group. I loved having the team over for painting t-shirts for a big meet. Swim team girls painting t-shirts for a meet in our back yard with their coach. Most of all, l I loved seeing my kids smiling, laughing and enjoying their friendships. 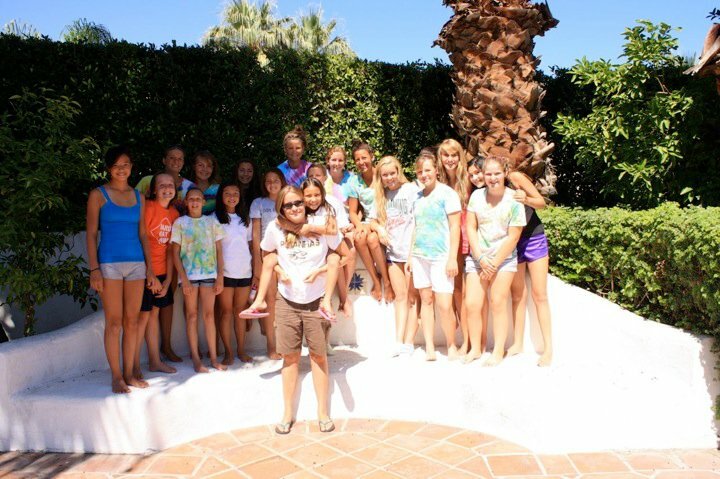 Throughout the years, my kids were surrounded by amazing kids, families and coaches. Just being in the background was a joy. Group photo on t-shirt painting day. My daughter receiving ribbons from her first coach. This week, while I am recovering from surgery, I am reposting some of my earliest blog posts. Enjoy! I’ll try to make it back to work next week. 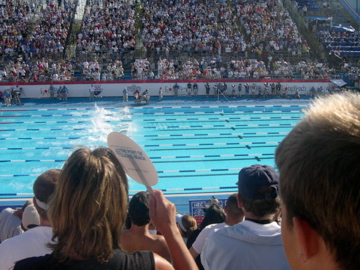 I was sitting outside a roped off area with a sign posted “No Parents Allowed” at a three-day swim meet in LA with close to 1,400 swimmers. 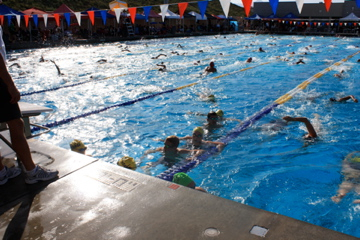 “But, I HAVE to get my son this bottle of water,” a mom begged the volunteer parent wearing a neon orange vest, who was in charge of guarding the entrance to the “swimmer’s only” area. “ARE YOU PROMISING TO GET MY SALLY TO HER EVENT ON TIME? I’M HOLDING YOU ACCOUNTABLE!” another mother yelled with her finger wagging in the face of the orange-vested volunteer. The mom was shaking in frustration and anger. I sat calmly by — watching, observing, and remembering — that was me. Not the yeller, but the one pleading. My daughter is 18 and going off to college next fall. 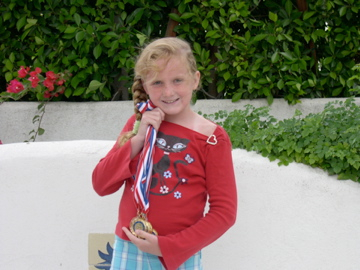 She’s been a swimmer since age five. Helicopter after helicopter mom argued and pleaded with the volunteers, who are swim parents themselves, on how they’d just be a second to find their child, bring them water, lunch, or make sure they made it to their event. I wanted to tell them “RELAX!” If their swimmers had made it this far, to the season’s championship meet, they’re going to be okay. Calm down, let them hang out with their friends and teammates. They’ll be fine and will survive. 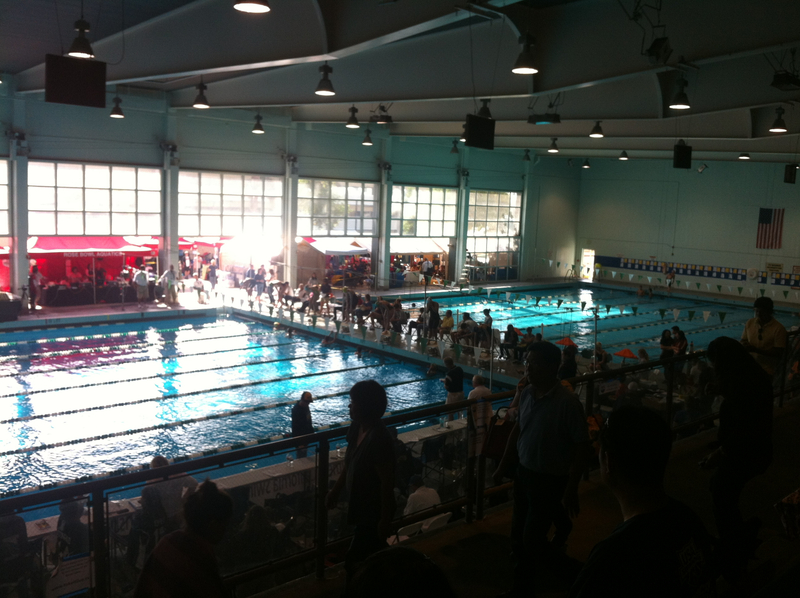 After all, I had just made it through watching my daughter swim the mile. 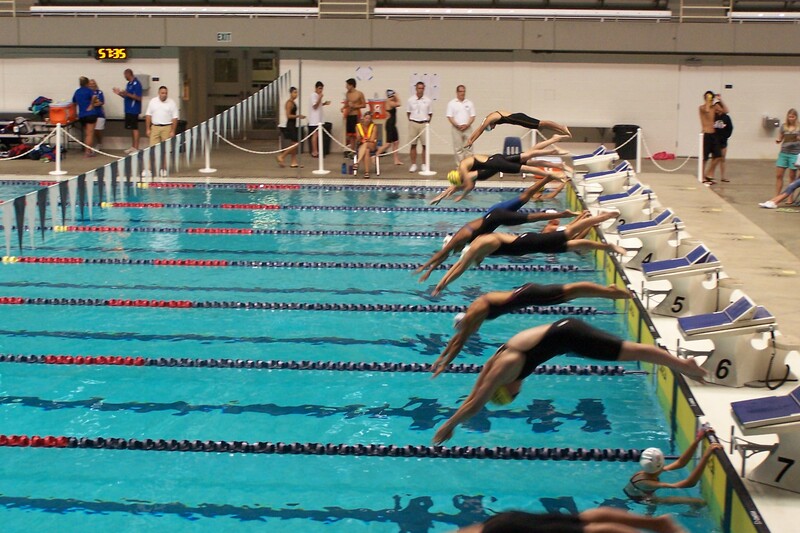 I didn’t get up once and scream, “GO!” which I have done at every flip turn for the past 15 years. If I can calm down and let go — you other moms can too! And — if they don’t drink enough water, or miss their event — they might actually learn from it. Here are 10 great things to remember as a parent of children in any sport. It’s from USA Swimming. 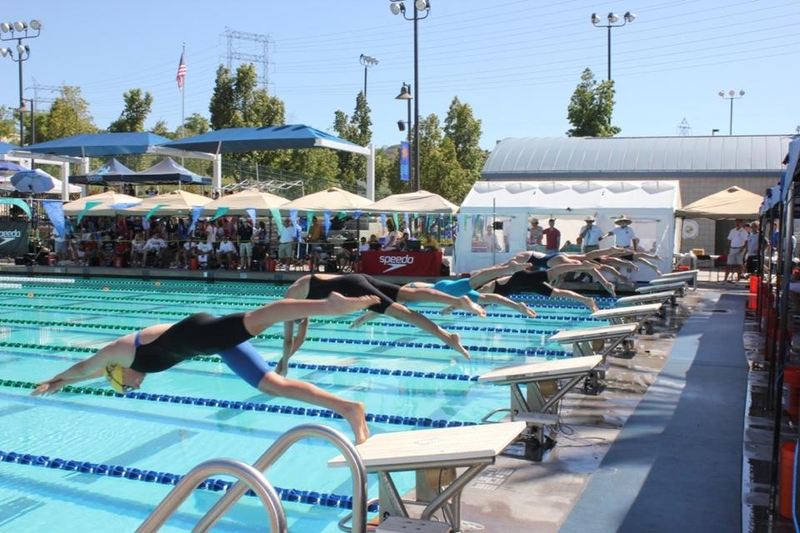 More handy tips can be found at USA Swimming’s page for parents. 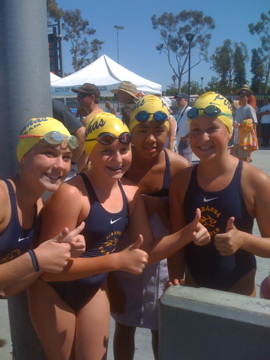 FYI, the top photo of my daughter’s relay team was taken by a 12-year-old teammate, who obviously can make it to her events, stay hydrated, swim fast, and take great pics! The second photo is my daughter 12 years ago. The last photo was taken from the “parents only” section of the East LA College pool. 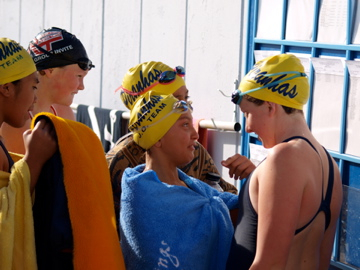 Video of my daughter’s 400 free relay from TAKEITLIVETV from Feb. 17.